Happy Thanksgiving! 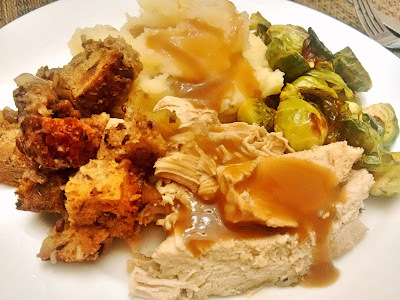 I made my Thanksgiving dinner in the slow cooker, which is perfect if you are cooking a skinless turkey breast. I based this recipe off one from shugarysweets.com. I made a few changes to the recipe. This recipe is perfect for a small group, or even just a family dinner. The highlight of this dinner was the stuffing. I had gone to the grocery store to pick up all the ingredients, and despite having a list, missed the bread completely. I asked my boyfriend to pick up some bread for me, and he chose a loaf of artisan multigrain pumpkin seed bread from the bakery section, which gave the stuffing a great texture and flavour. The downside of this recipe is that there are no drippings with which to make gravy, so I just used a packet to make turkey gravy. Spray slow cooker pot with Canola spray. Place turkey breast in slow cooker pot and pour chicken broth over top. Drizzle a little olive oil on top of turkey, then season with black pepper. In a large mixing bowl, combine bread cubes, celery, onion and apple. Add salt, poultry seasoning, sage and pepper and toss to coat. Pour stuffing over top of turkey breast and slice the tbsp of butter into small chunks and evenly distribute across the top of the stuffing. Place lid on slow cooker and cook for 4.5 hours on high.